“From the South of Italy to the North of England…You’ll find us on the first floor of John Lewis.” What is with Newcastle’s department stores? Fenwick and John Lewis appear to have challenged each other to an all-out restaurant war. 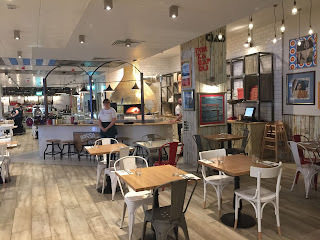 While Fenwick brought in the local big guns - Terry Laybourne and his team helped create a really snazzy food hall with some great eateries, including a fishmonger and seafood bar, an Asian noodle restaurant, and an excellent Mediterranean joint called Fuego — John Lewis turned to Rossopomodoro. I guess it’s "authentic", whatever that means: there are 70 of them in Italy itself. It’s a chain that originated in Naples. Not that this guarantees good food, of course. I mean, I’d scarcely expect my Italian friends to get too excited if Upper Crust suddenly announced it was bringing its uniquely British baguettes to Rome. 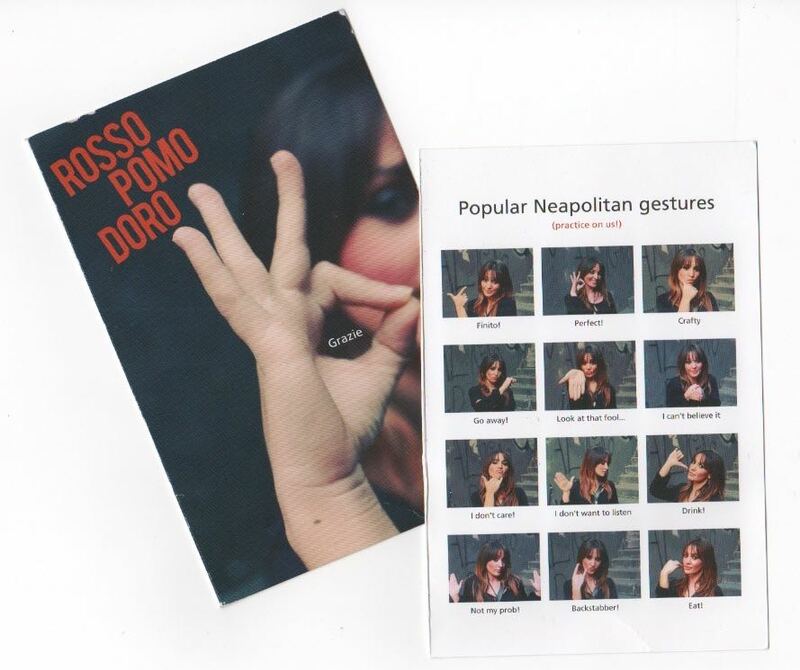 But Rossopomodoro does make great claims for its food. “You won't find more authentic pizza than ours outside Naples,” says its British website, and the Italian version proudly declares its passion for “Neapolitan culinary culture”. They clearly think they’re very good indeed. I gave them plenty of time to settle in after they opened last October. I suspected that the company will have jetted in their training team for the first few weeks - I wanted to see how the restaurant had bedded down since then. The restaurant is in ladies’ wear, which is a bit dangerous when you’re out with Mrs Diner. 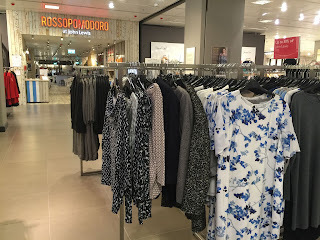 However she had no problem ignoring this maze of frocks. They haven’t exactly framed their new Italian restaurant with their designer collections. Instead, we weaved our way round oversized flowery blue dresses and cotton blouses until we found it: an orange sign on wood cladding, outside what used to be the Brasserie. I quite liked that Brasserie — the food was good and you could watch shoppers wandering around down below from the balcony. The balcony’s still there, but the room has been redressed with bare wood, white chairs, a few blue and white stripes to prove you’ve crossed the Italian border, and, right in the centre, an enormous gold-tiled pizza oven. It looks like a giant tagine, or the shining dome of a Turkish mosque. 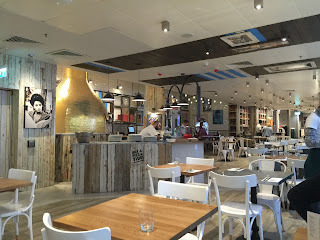 They have installed these ovens in all Rossopomodoros across the globe, a genuine Napoli wood burning specimen, but instead of artisan tiles, shiny gold mosaic. Inside the oven, the fire was roaring rather too optimistically, for the restaurant was virtually empty. We were sat by the balcony, being looked after by a delightful waitress. After several futile attempts to shore up our table, which was wobbling dangerously and required no fewer than three menu cards to stabilise it, she revealed that, though Romanian, she had spent 9 months in Milan. We started with wine. She advised us to order the Montepulciano (£5.95/19.95) but I stubbornly ignored her counsel and instead chose the more expensive Nero d’Avola (£7.95/27.95). It was so appallingly acidic, I had to eat humble pie and beg her to swap it for the Montepulciano, which she did very graciously. This was smooth and balanced. Having messed up the wine, I decided to follow her advice when it came to the food. I ordered polpette — meatballs — which were quite awful. 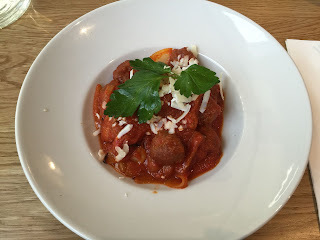 Small mealy marbles of almost flavourless pork floated in an Amatriciana sauce that had all the subtlety of Donald Trump, a concoction so raw and spicy I needed most of my glass of wine to cool off. The tomatoes had scarcely been reduced, while the onions were undercooked and bitter. 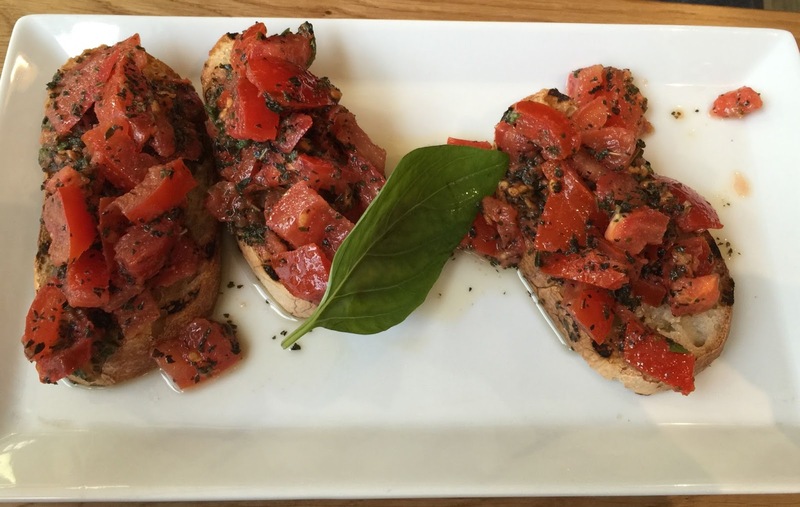 Meanwhile Mrs Diner’s bruschetta had a mundane pomodoro topping with none of the fresh, straight off the vine tomato flavour you’d expect to find in any self-respecting café in Naples. Slung on the plate, they simply tasted as though they had been hanging about a bit. 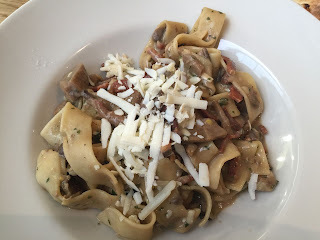 Next, we ordered two pasta dishes and a pizza of salsiccia and friarelli - pork and fennel sausage, broccoli rabe, with a white smoked mozzarella sauce. All three arrived at the same time. I’m guessing that the pizza had been waiting around for the pasta, for it had already lost any bubbling freshness it might have displayed in the oven. As a result, the soupy smoked mozzarella centre — the special characteristic of any Neapolitan pizza — had long since turned into a congealed béchamel. 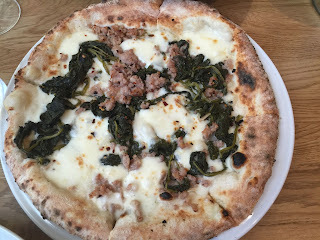 Broccoli rabe was properly bitter, though, and the sprinkling of pork sausage had a nice infusion of fennel, but the pizza crust was already as flaccid as my mood. Mind you, this pizza was almost decent compared to our pasta. 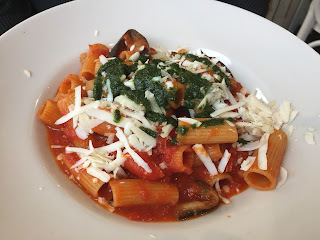 Mrs Diner’s rigatoni contained a couple of bits of rubber aubergine in a sea of unreduced canned tomatoes instead of the promised cherry tomato sauce. For a restaurant called the red tomato, this was almost ironic. Meanwhile my own dish, a “Gourmet Neapolitan pasta" of wild mushrooms and smoked speck, was seriously awful. 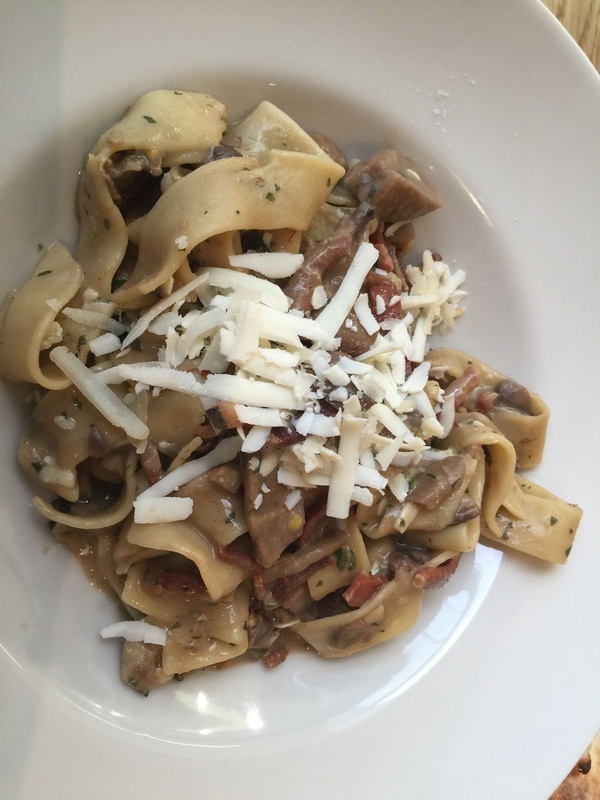 Strands of gloopy pappardelle clung to each other for comfort amongst pieces of mushroom, smoked ham, and whole, completely tasteless, chestnuts. This concoction was topped with a few shavings of “tangy” pecorino cheese that appeared to have long ago lost its tang. “Well, it can’t get any worse,” sighed Mrs Diner, as we looked through the dessert menu. Oh yes it could. 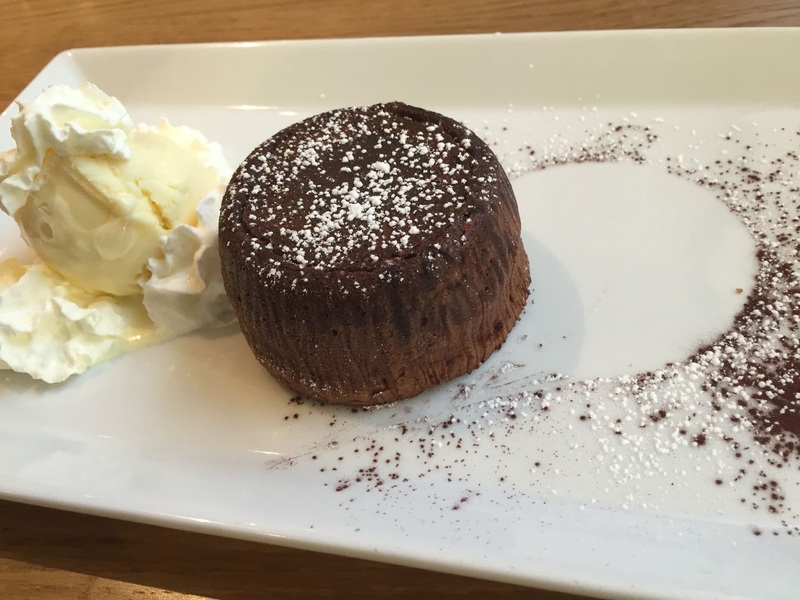 Mrs Diner had a dark chocolate soufflé, which had been baked so thoroughly, its base and sides had turned solid. It was so hard it had slid around the plate during delivery. I ordered tiramisu. Unfortunately I mustn’t have read the menu properly, for when it arrived, the mascarpone had been replaced with Nutella. It was basically a slice of Nutella pie. There were squiggles of it everywhere. 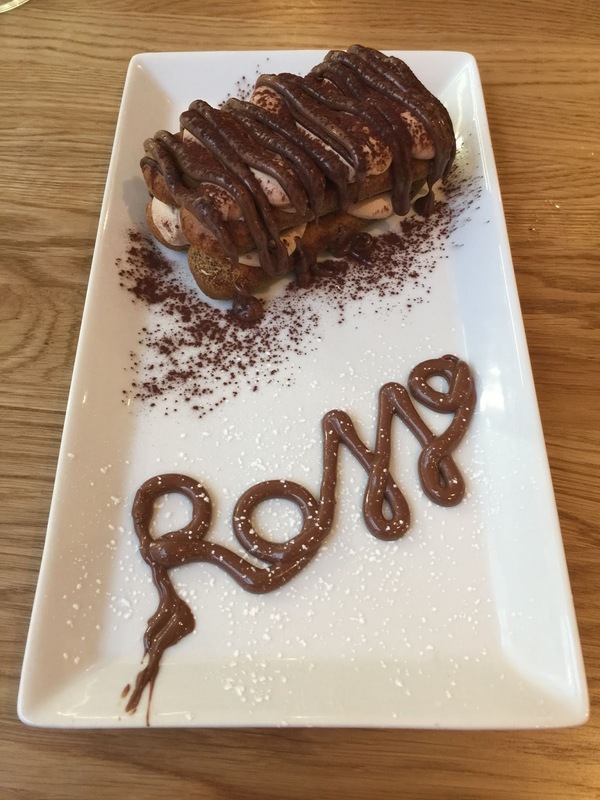 The word Rosso had been written across the plate in Nutella. Junior Diner would have been in heaven. I just wanted to go home. After coffee, I noticed a card on the table with pictures of “popular Neapolitan hand gestures”. The card invited customers to practice the gestures on the staff, denoting things like: Eat, Perfect, Drink, Look at that food!, and so on. Unfortunately I couldn’t find the hand signal representing my precise mood at that time. So instead I just waved my fingers in that universal language for “Can I have the bill, please?”. It came to £98.38.